Every so often, The Legal Genealogist is confident, the planets align, the stars twinkle just so, the sun kicks off solar flares of some intensity — and the internet goes complete crazy. You’ve seen this, I’m sure, at one time or another, with some piece of utter misinformation that just can’t seem to be stamped out. 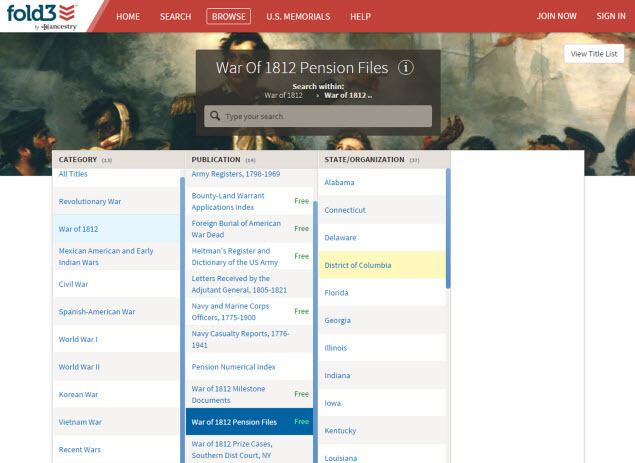 And this week the piece of utter misinformation that I’m dealing with is that Fold3.com will charge to get to the War of 1812 pension files we’re all crowdsourcing through the Preserve the Pensions project. The records will always be free. You will never need to subscribe to Fold3 or Ancestry or any other pay service of any kind to access the War of 1812 pension files. Click on this link: https://fold3.com/browse/247/h5iT6dgqR. That’s it, folks. That’ll open up the menu you see below and you can choose any state — or even search for a specific name within the database. All absolutely positively free. 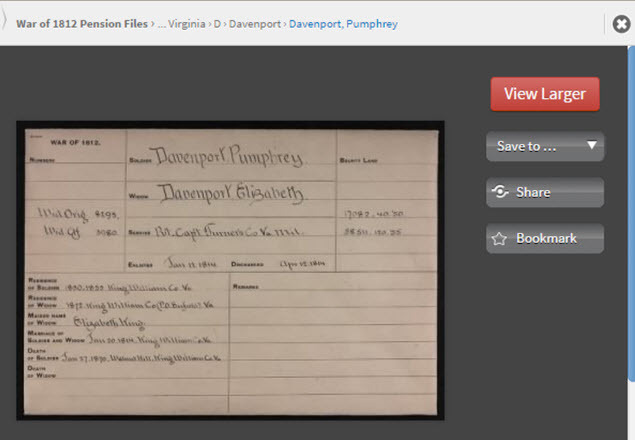 Once you locate a file you want to look at, say, for Pumphrey Davenport of Virginia, you will see that that individual file also has an indication on it — it’s free. Go right ahead and click on the record description, and you’ll be able to look at and download every single document in the file — free. 2. Choose any entry in the category list, from All Titles right down to Non-military Records. 3. A menu will open up to the right of the category list, and any database that is free will have the word Free next to the database name. So… with luck the planets are now aligned, the stars twinkling just so, the sun flaring benignly and we can all go back to contentedly browsing the War of 1812 pension files on Fold3.com — absolutely positively free. Great news! Thanks for the info. I haven’t searched this record set yet but I’m looking forward to doing so. I wonder if any of my ancestors served? It seems like a lesser proportion of the population served in the War of 1812 than the other wars. Remember that serving in that war doesn’t necessarily mean there will be a pension record. The first statute giving pension benefits for service (rather than to invalids or widows) wasn’t until 1871. I just found on FamlySearch a pension application for a mother (Permelia) of a soldier, William A. Rogers, who died in 1865. She applied Dec 3, 1868, and the image says she applied as “mother.” Permelia was still married until her own husband (William Sr.) died in 1871. Was her pension perhaps fraudulent or did the pension get granted in error? She was collecting her $8/month until she died in 1886. NOne of these pension records were included when I got the Compiled Service Records for young William several years ago. – Thanks. Have you reviewed the statutes for the time period to see what the eligibility requirements were for Permelia as the mother of the soldier, and then compared what she said to the statutory requirements? That’s always the place to start. The names seen to end at M. I need W.
That’s why the fundraising has to continue! To get ALL the files digitized. I am trying to get a status update for the project to digitize the 1812 records. Neither Fold3 nor FGS the sponsor has responded. Can you help? The online status hasn’t changed for at least 18 months – still at M! All we have been told is that there is a hold-up at the National Archives that the project is working feverishly to resolve. Thanks for such a prompt response. Looking forward to your posts following your meetings at the National Archives.